Now, you might not know this, but I love me some Pad Thai. Actually, I can say that I’m sort of obsessed with Pad Thai. Unfortunately, it’s something I don’t eat as much as I would love to — and not just because it’s not strictly paleo/primal, I do make exceptions you know. Truth is, I don’t like to fill up on noodles and feeling full for hours after eating them. 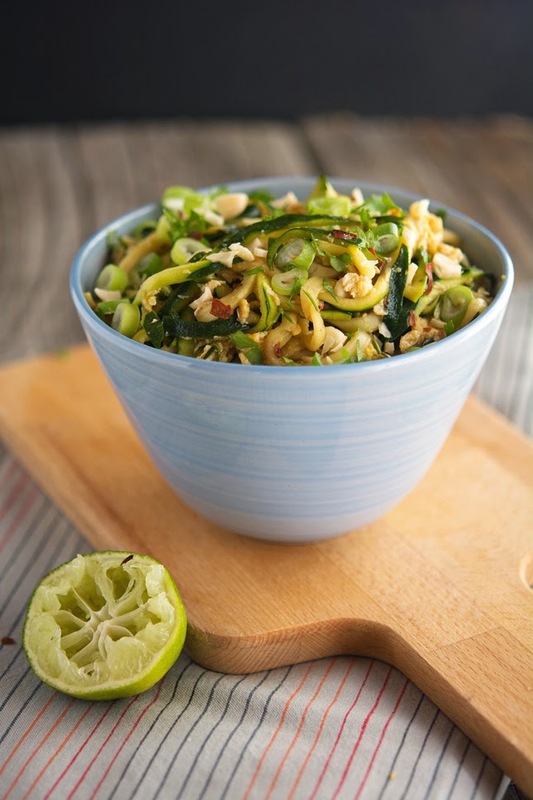 So here’s the solution...Pad Thai made with zoodles. You can argue that this is really not Pad Thai — where are the rice noodles dude? Just think of this as healthier/lighter version of Pad Thai. So easy. So adaptable. So exactly what I felt like eating. Sit down and enjoy man, you’re going to like this one. 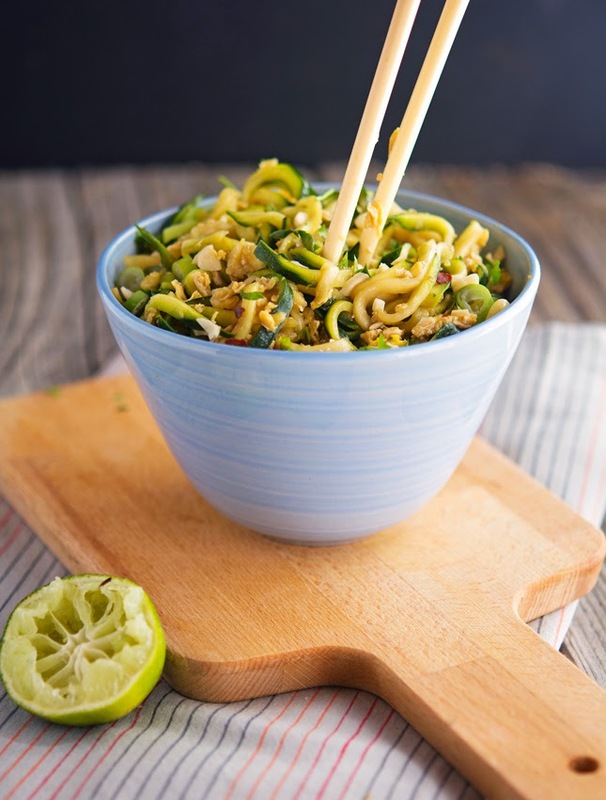 Easy Pad Thai Zoodles Print this recipe! Note. This is a basic Pad Thai recipe. Feel free to add shrimps, firm tofu, garlic chives, pickled turnips, banana flowers, bell peppers, to make it a complete meal. *If you don’t care about paleo (or to keep it more authentic) use peanuts. In a small bowl stir together soy sauce, lime juice, sugar, fish sauce, tamarind paste and red pepper flakes. Set aside. Using a spiralizer or peeler create zucchini spaghetti (always read the directions for your spiral slicer as they vary by brand.) If you don't have a spiralizer use a regular vegetable peeler to vertically peel long, thin strips of the zucchini. This will form more of a wider "noodle" from the zucchini, like fettuccini. Let the noodles rest for about 3 minutes so that they can release all of the moisture. Transfer noodles to a bowl and drain the excess water from the pan. Wipe the pan and heat the remaining tablespoon of olive oil over medium-high heat. Add garlic and saute’ for about 1 to 2 minutes, until fragrant. Add scallions and saute’ for 1 to 2 minutes or until tender. In a small bowl lightly beat eggs with a fork. Pour them into the pan and cook until they solidify, but are still moist - move the eggs around the skillet as they cook, so that they scramble a bit. Pour the sauce into the skillet with scrambled eggs. Add the zucchini noodles and cook for about 1 more minute or until heated through. Sprinkle with chopped cilantro and chopped almonds/cashews and serve. One serving yields 307 calories, 21 grams of fat, 20 grams of carbs and 13 grams of protein. Oh this looks so good! I love Pad Thai, and I love the idea of making it healthier. It's really good Marjorie, you should totally try it! Love this idea! I just posted a Zoodles recipe a week ago - and I am loving my spiralizer. I need to try this next. The spiralizer is the coolest gadget ever, whoever invented it is a freaking genius! I absolutely love Pad Thai and never order or make it because I love my waistline even more, and wow that dish is a carb bomb. High five for your version! Thank you for the high-five my friend. Right back at ya! I am loving how you are rocking the tamarind paste, Mike! 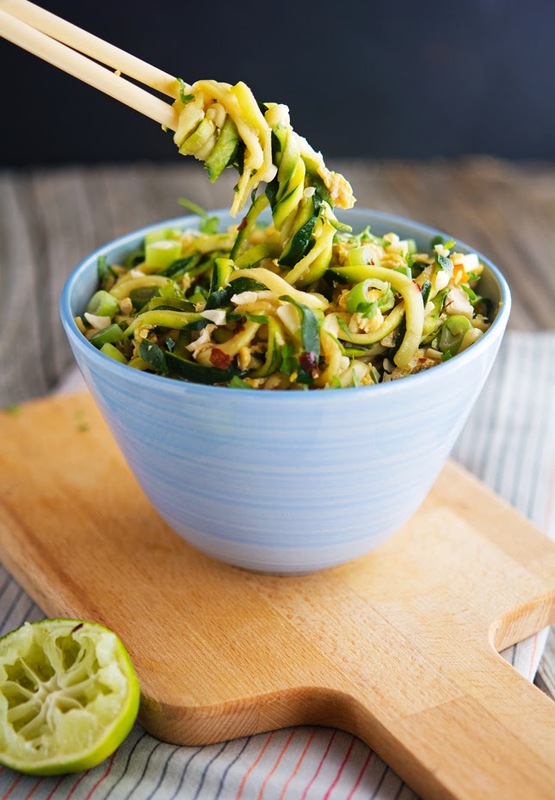 If I was your neighbor - I would come over with my own bowl as soon as I got a whiff of these pad thai zoodles! I know right? Since I bought it, I can't get my hands off it. Have you as a neighbor would be awesmazing! I want to try it as well with sweet potato noodles...but also what about soba-style zoodles? I think it could be amazing! 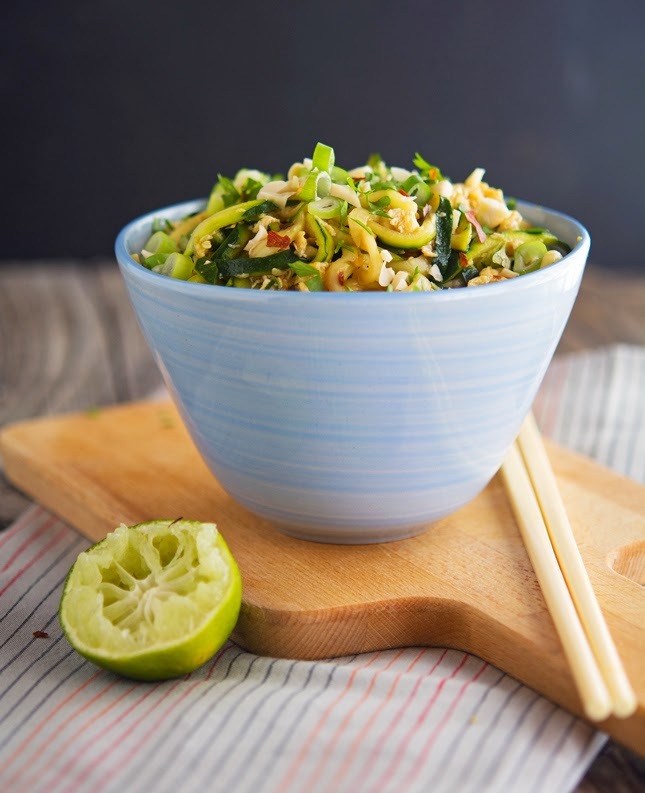 Hi Mike, this could easily be one of my most favorite meals, love this twist on pad thai! Yummy love the look of this and your new blog make over! Very fresh and clean looking massive thumbs up! I always feel guilty after eating pad thai and that's mainly due to the carb laden noodles. Thanks for sharing this lightened up pad thai version Mike, I most definitely will not feel guilty about devouring a bowl! Yes! Loving this dude... I make a pad thai with spaghetti squash that is pretty legit (in a completely unauthentic way, of course). This looks pretty epic as well. Gonna have to try the zoodle #wolfpackeats edition of pad thai! I need to try pad thai spaghetti squash, sounds so legit! I know how important is tamarind paste in Thai cuisine, unfortunately is not that easy to find so I don't want to be like a non-negotiable ingredient. Of course, without is less authentic but still pretty darn good. Hahaha Line, you're so funny! But before we can marry you have to try Pad Thai, it's so good! This looks delicious Mike, I've never tried pad thai, but I love Asian cuisine of any kind. I'm loving your new blog look! I've been considering making over mine as well, but have been putting it off. Hope you're well buddy! This is such a classic made healthy! Love it! Thank you Ali, coming from you (the spiralizer Queen) it's golden! I made this tonight and found an issue in your recipe. You have Coconut Palm Sugar in your list of ingredients but you don't mention it at all in the directions. I am guessing it was meant to go in with the sauce? As a result I accidentally omitted the sugar altogether and we ended up with a very lime zesty meal that was a bit too sour to be entirely edible. I'm sorry for this, I just fixed it. Hmmm..I'm not sure where my other comment went...So i will try again. This looks awesome! I love Pad Thai! I just bought some tamarind paste online. I do have a question..how many servings does this make? Thanks! No worries, glad you're enjoying the blog! This is an amazing dish! I didn't see where is said to add the bean sprouts, but I added them shortly after the scallions. I also made this a pork dish by cooking the pork separately and then letting it soak in the sauce while I prep everything else Husband loves it! Pad Thai is a go to comfort for me and it's awesome to have a healthier alternative. Thanks! adding to my meal plan for next week. i looooove pad thai and i love my spiralizer, so always looking for new ways to cook with it. love it! Let me know how you like Lindsey! I am allergic to all nuts what can I use instead of the cashews? I just wanted to let you know if you need a new best friend... send me an application. I'll even provide references. I literally just started a mostly paleo/primal..probably more primal diet, and this dish is amazing, nay life-changing. Can't wait to try more! At least now I can feel a little less sad about not following sallysbakingaddition or browneyedbaker...which are not paleo in even the slightest. Absolutely NO words!! Delish!!! I added the zucchinis at the very end, so they stayed crunchy and mmnn!!!! Soooooo yummie! !